Season the chicken generously with salt, pepper, paprika and then rub with BBQ sauce. Marinate for 20-30 minutes. In the meantime, heat up the grill and grease it with olive oil or cooking spray. Grill the chicken for 5 minutes on each side or until well done. Remove from grill and let cool for 10 minutes so it's easy to handle. Cube the chicken into 1/2" pieces and place into a medium sized bowl. Mix with onions and the red peppers. In a separate small bowl, combine the mayonnaise and the mustard, mix thoroughly and season with salt and pepper. Place the mayo/mustard mixture into the bowl with the chicken and veggies. Mix the chicken salad well until the mayonnaise mixture is incorporated. 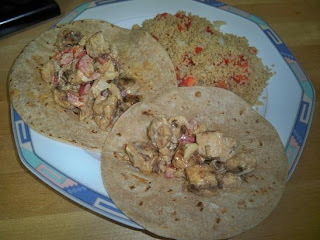 The last step is to place the chicken salad into lightly toasted tortillas. And as for the cous-cous, I used a whole wheat type, followed directions on the box and then mixed it with the remainder of diced onions and red peppers. So light and so delicious. Enjoy!